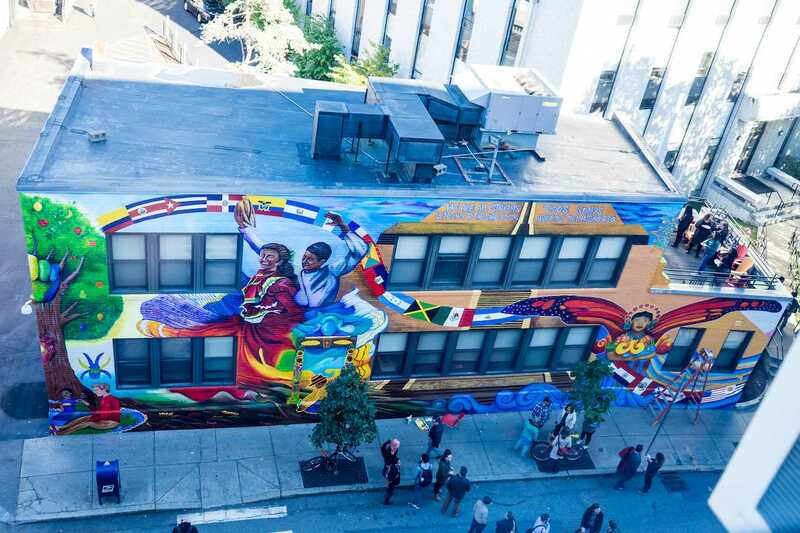 Walking down Forsyth Street, it’s hard to miss the Latino/a Student Cultural Center’s (LSCC) bright new exterior, which got a vibrant makeover this week in the form of a mural covering the building’s whole facade. The LSCC unveiled the mural, titled “We Are All Streams Leading to the Same River,” at a special ceremony on Tuesday. The artwork is rich with luminous depictions of Latinx cultural images and symbols of unity such as an Incan person, a tree with a multicolored fist growing out of it, a couple dancing in traditional clothing and many Latin American flags spawning from the LSCC logo. Members of the LSCC collaborated with renowned muralist Susan Cervantes and her foundation Precita Eyes, a community-based mural arts organization from San Francisco, to design the mural. The project began over two years ago when Northeastern seniors Amy Lyu, a graphic and information design major, and Yosh Rozen, an industrial engineering major, had an idea to make the LSCC easier to find. In the span of just one week, over 180 members of the Northeastern community, including students, staff, alumni, student groups and university departments came together to hand-paint the mural on Forsyth Street. The mural mainly features Latinx culture, but it is also meant to be a tool for promoting inclusion and understanding on campus. In addition to Spanish and English words, the mural also features words in languages like Chinese and Korean. This is part of their goal of showing that anyone is welcome at the LSCC, according to Lyu. “We want people to walk by it and see how there are so many different kinds of people, and we want people who aren’t Latino to come and feel included and be knowledgeable about other races and cultures,” Lyu said. The new mural also provides a refreshing aesthetic change for one of the oldest parts of campus, which mainly consists of brick, concrete and pavement.